I am so excited to show you guys these swatches - they combine two of my recent purchases, both of which I'm exceptionally happy about! As soon as the Femme Fatale website introduced international shipping I snapped up some Arcane Lacquers I'd been eyeing up. The shipping didn't come cheap, but I definitely feel it was worth it - Sophie was really helpful and the package came lightning fast. The first polish I tried was Funhouse - a magenta base filled with a mix of magenta and blue glitter. These swatches show three coats of Funhouse with one layer of Glitter Food and one layer of Jordana Quick Shine topcoat. Formula was perfect so application was nice and easy. 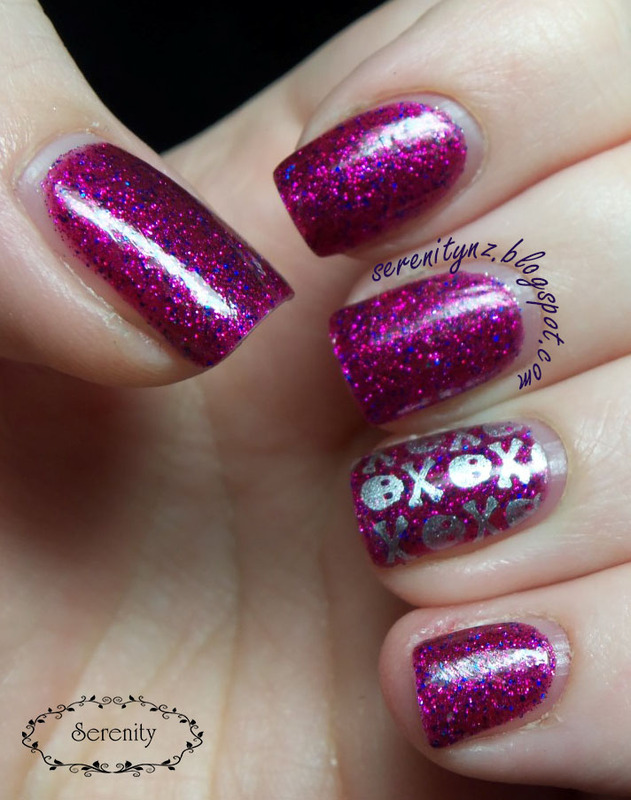 I adored this mani and I'm looking forward to trying the other Arcane Lacquers I purchased, as well as the other stamping designs. 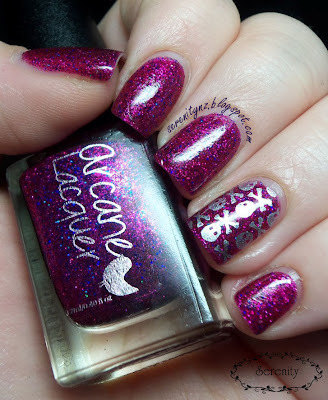 Arcane Lacquer is available within Australia at Arcane's etsy shop, or internationally at Femme Fatale or Llarowe. Vivid Lacquer plates and polishes can be found at her etsy shop, and she ships worldwide. ooo pretty. the depth in it!!! Definitely one of my faves! Fyrinnae 'Winter 2013' - Swatches! Notoriously Morbid 'A Dark Christmas Dream' Swatches! Femme Fatale Nail Lacquer - Swatches & Review! Notoriously Morbid - More Swatches! serenitynz.blogspot.com. Ethereal theme. Powered by Blogger.